by Chris Woodford. Last updated: April 13, 2018. Oil may be the world's favorite fuel, but not for much longer. Modern homes are powered mostly by electricity and it won't be long before most of us are driving electric cars as well. Electricity is superbly convenient. You can produce it in all kinds of different ways using everything from coal and oil to wind and waves. You can make it in one place and use it on the other side of the world if you want to. And, once you've produced it, you can store it in batteries and use it days, weeks, months, or even years later. What makes electric power possible—and indeed practical—is a superb electromagnetic device called an electricity generator: a kind of electric motor working in reverse that converts ordinary energy into electricity. Let's take a closer look at generators and find out how they work! Photo: A diesel electricity generator from the mid-20th century, pictured at the REA Power Plant Museum near Hampton, Iowa. Courtesy of Photographs in the Carol M. Highsmith Archive, Library of Congress, Prints and Photographs Division. The best way to understand electricity is to start by giving it its proper name: electrical energy. If you want to run anything electrical, from a toaster or a toothbrush to an MP3 player or a television, you need to feed it a steady supply of electrical energy. Where are you going to get that from? There's a basic law of physics called the conservation of energy that explains how you can get energy—and how you can't. According to this law, there's a fixed amount of energy in the universe and some good news and some bad news about what we can do with it. The bad news is that we can't create more energy than we have already; the good news is that we can't destroy any energy either. All we can ever do with energy is convert it from one form into another. Photo: A large electricity generator driven by steam at CalEnergy's Leathers geothermal power plant in Imperial County, California. Photo by Warren Gretz courtesy of US Department of Energy/National Renewable Energy Laboratory (DOE/NREL). If you want to find some electricity to power your television, you won't be making energy out of thin air: the conservation of energy tells us that's impossible. What you'll be doing is using energy converted from some other form into the electrical energy you need. Generally, that happens in a power plant some distance from your home. Plug in your TV and electrical energy flows into it through a cable. The cable is much longer than you might think: it actually runs all the way from your TV—underground or through the air—to the power plant where electrical energy is being prepared for you from an energy-rich fuel such as coal, oil, gas, or atomic fuel. In these eco-friendly times, some of your electricity will also be coming from wind turbines, hydroelectric power plants (which make power using the energy in dammed rivers), or geothermal energy (Earth's internal heat). Wherever your energy comes from, it'll almost certainly be turned into electricity with the help of a generator. Only solar cells make electricity without using generators. How can we generate electricity? 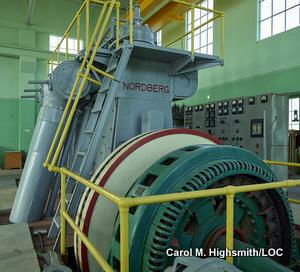 Photo: A typical electricity generator. This one can make up to 225kW of electric power and is used for testing prototype wind turbines. Photo by Lee Fingersh courtesy of US Department of Energy/National Renewable Energy Laboratory (DOE/NREL). If you've read our detailed article about electric motors, you'll already know pretty much how generators work: a generator is just an electric motor working in reverse. If you've not read that article, you might like to take a quick look before reading on— but here's a quick summary either way. An electric motor is essentially just a tight coil of copper wire wrapped around an iron core that's free to rotate at high speed inside a powerful, permanent magnet. When you feed electricity into the copper coil, it becomes a temporary, electrically powered magnet—in other words, an electromagnet—and generates a magnetic field all around it. This temporary magnetic field pushes against the magnetic field that the permanent magnet creates and forces the coil to rotate. By a bit of clever design, the coil can be made to rotate continuously in the same direction, spinning round and round and powering anything from an electric toothbrush to an electric train. Photo: The rotating part (rotor) of a typical, small electric motor. An electricity generator has exactly the same components but works in the opposite way, turning motion into electrical energy. Artwork: A simple generator like this produces alternating current (an electric current that periodically reverses). Each side of the generator (green or orange) is either moving up or down. When it moves up, it will generate a current flowing one way; when it moves down, the current flows the other way. If you're a meter connected to the wire, you don't know which way the wire is moving: all you see is that the direction of the current periodically reverses: you see an alternating current. The important thing to notice is that you generate a current only when you move the wire through the magnetic field (or when you move a magnet past a wire, which amounts to the same thing). It's not enough just to place a wire near a magnet: to generate electricity, either the wire has to move past the magnet or vice-versa. Suppose you want to generate lots of electricity. Lifting a wire up and down all day isn't going to be much fun—so you need to devise some way of moving a wire past a magnet by mounting one or the other of them on a wheel. Then, when you turn the wheel, the wire and magnet will move with respect to one another and an electric current will be produced. Now here's the interesting part. 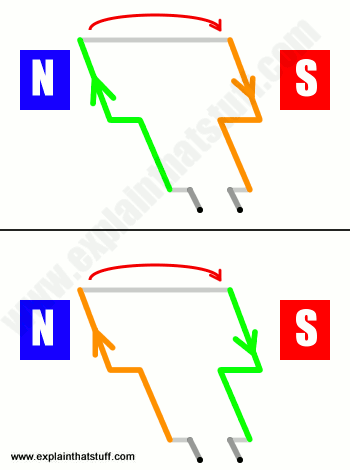 Suppose you bend a wire into a loop, sit it between the poles of a magnet, and arrange it so it will constantly rotate—as in the diagram here. You can probably see that as you turn the loop, each side of the wire (either the orange side or the green side) will sometimes be moving up and sometimes moving down. When it's moving up, electricity will flow one way; when it's moving down, the current will flow the other way. So a basic generator like this will produce an electric current that reverses direction every time the loop of wire flips over (in other words, an alternating current or AC). However, most simple generators actually produce direct current—so how do they manage it? Just as a simple DC electric motor uses direct current (DC) electricity to produce continual, rotary motion, so a simple DC generator produces a steady supply of direct current electricity when it spins around. Like a DC motor, a DC generator uses a commutator. It sounds technical, but it's just a metal ring with splits in it that periodically reverses the electrical contacts from the generator coil, reversing the current at the same time. As we saw up above, a simple loop of wire automatically reverses the current it produces every half-turn, simply because it's rotating, and the commutator's job is to cancel out the effect of the coil's rotation, ensuring that a direct current is produced. 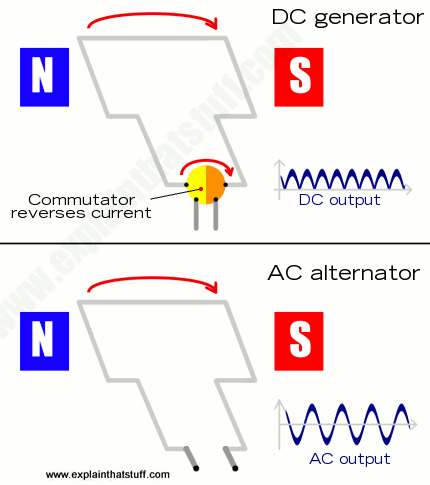 Artwork: Comparing the simplest DC generator with the simplest AC alternator. In this design, the coil (gray) spins between the poles of a permanent magnet. Each time it rotates through a half-turn, the current it generates reverses. In the DC generator (top), a commutator reverses the current every time the coil moves a half-turn, cancelling out the reversal of the current. In the AC alternator (bottom), there is no commutator so the output simply rises, falls, and reverses as the coil rotates. You can see the output current from each type of generator in the chart on the right. What if you want to generate alternating current (AC) instead of direct current? Then you need an alternator, which is simply an AC generator. The simplest kind of alternator is like a DC generator without a commutator. As the coil or magnets spin past one another, the current naturally rises, falls, and reverses, giving an AC output. 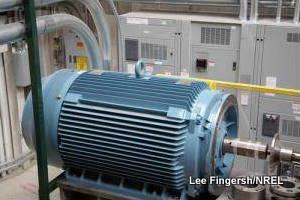 Just as there are AC induction motors, which use electromagnets to produce a rotating magnetic field instead of permanent magnets, so there are alternators that work by induction in a similar way. Alternators are mostly used for generating electricity from vehicle engines. Cars use alternators, driven by their gasoline engines, which charge up their batteries as they drive along (the AC current is converted to DC by diodes or rectifier circuits). Photo: An alternator is a generator that produces AC (alternating current) instead of DC (direct current). 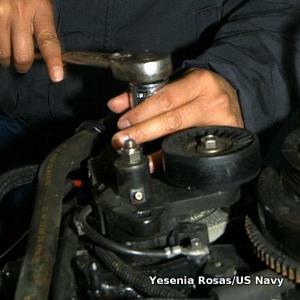 Here we can see a mechanic removing the alternator from an outboard motor boat engine. Photo by Yesenia Rosas courtesy of US Navy. Photo: A portable electricity generator powered by a diesel engine. Photo by JoAnn S. Makinano courtesy of US Air Force and Defense Imagery. Most of the time we take electricity for granted. We switch on lights, TVs, or clothes washers without stopping to think that the electrical energy we're using has to come from somewhere. But what if you're working outdoors, in the middle of nowhere, and there's no electricity supply you can use to power your chainsaw or your electric drill? One possibility is to use cordless tools with rechargeable batteries. Another option is go for pneumatic tools, such as jackhammers. These are entirely mechanical and powered by compressed air instead of electricity. A third option is to use a portable electricity generator. It's simply a small gasoline engine (petrol engine), similar to the compact engine you get on a motorcycle, with an electricity generator attached. As the engine chugs away, burning up gasoline, it pushes a piston back and forth, turning a generator and producing a steady electric current as its output. With the help of a transformer, you can use a generator like this to produce pretty much any voltage you need, anywhere you need it. As long as you have enough gasoline, you can make your own electricity supply indefinitely. But remember the conservation of energy: run out of gas and you run out of electricity as well! Artwork: Generator technology advanced rapidly during the 19th century. English chemist and physicist Michael Faraday built the first primitive generator in 1831. Within a few decades, numerous inventors were building practical electric generators. 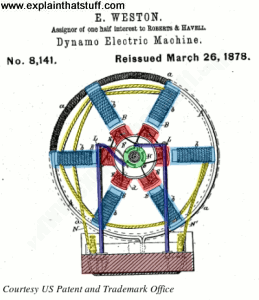 This one (a "dynamo-electric machine") was designed by Edward Weston in the 1870s as a way to "transmute mechanical energy into electrical energy with greater efficiency than heretofore." It has a static outer ring of magnets (blue) and a rotating armature (coils) in the center (red). A commutator (green) converts the generated current to DC. From US Patent 180,082 reissue 8,141 by Edward Weston, courtesy of US Patent and Trademark Office. How does a generator work? : An excellent short video by Dr Jonathan Hare and the Vega Science Trust demonstrates very clearly how moving a coil through a magnetic field can produce electricity. Simple generator: electric generator for science fair: William Beaty gives a step-by-step guide to building a simple generator using easy-to-find components (enamel wire, magnets, cardboard, and so on). Bicycle generator: How to power a food processor with a bicycle driving an alternator (a type of electricity generator). Quite a neat experiment, though the commentary could be a little clearer. Stallcup's Generator, Transformer, Motor and Compressor by James G. Stallcup. Jones & Bartlett Learning, 2015. A practical reference for people who have to design and use rotating machinery. Diesel Generator Handbook by L. L. J. Mahon. Newnes, 1992. An old (but still relevant) detailed technical reference aimed at both engineers and academics. Electricity for Young Makers: Fun and Easy Do-It-Yourself Projects by Marc de Vinck. Maker Media, 2017. 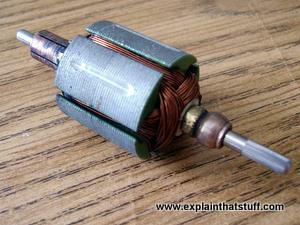 Learn about electricity by building motors and other electric kit. Eyewitness: Electricity by Steve Parker. Dorling Kindersley, 2005. Are Stationary Bikes that Generate Electricity Making a Comeback? by Andrew Silver. IEEE Spectrum. December 22, 2016. An update on the idea of using exercise bikes to make power. Is it a credible idea or are you wasting your time? 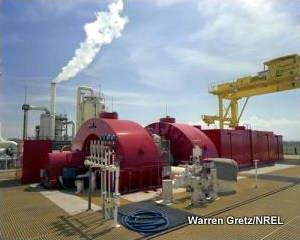 Power Grids Iffy, Populous Areas Go for Generators by Ken Belson. The New York Times. April 24, 2013. Describes how people have acquired their own diesel or natural gas generators to cope with power outages in rural areas. These Exercise Machines Turn Your Sweat Into Electricity by Tom Gibson. IEEE Spectrum. June 21, 2011. Can you really generate useful amounts of electricity from an exercise bike? Not really, is the short answer.